There is going to be a new label added to my posts "Quilts- finished". I wonder how many posts are going to make there way there?? No doubt there will be a whole lot more in the "works in progress" label!! This quilt was started waayyyyyy back in about 2001. 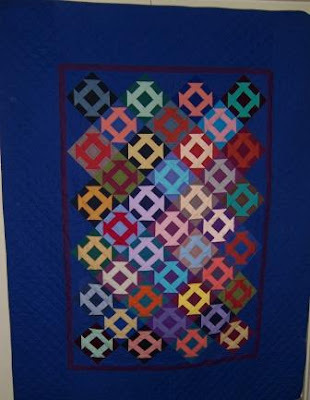 My sister-in-law picked it out of the Australian Patchwork and Quilting book ,"Colourful Scrap Quilts". She picked it out to go with her new sofa which was in the blue colour, similar to the border on the quilt. It is a quilt by Michelle Marvig and she called it "Amish Monkey Wrench". In my case, it was more like a "monkey wretch". From go to woe I had big troubles with this quilt, which is why it probably sat in the cupboard unfinished for so long. Piecing is not my forte and things didn't go well there, and then I did a bit of accidental cutting as I was trying to "square" the quilt up and left a few of the seam allowances a bit scant. Oh yeah, if it can be done I can do it. Then, I stretched one of the inner border to fudge a fit, and that came back to bite me in the rear when it came to quilting it. Some things do not "quilt out". 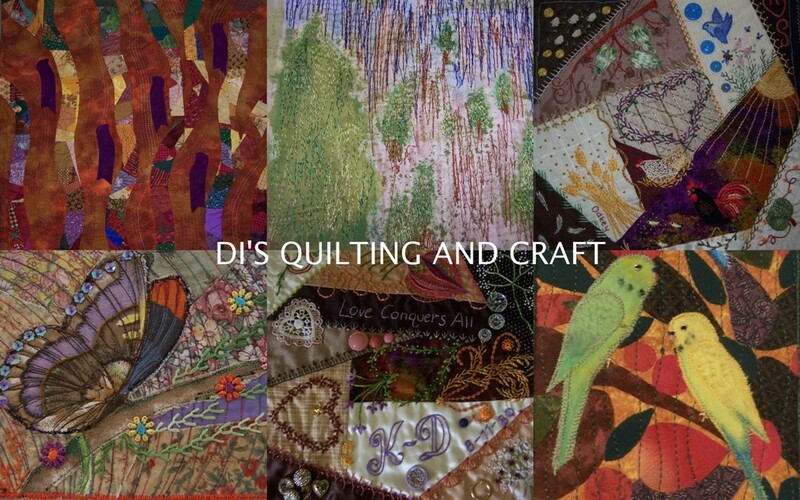 The most enjoyable part of the whole process for me was the hand quilting. It mostly ran smoothly, except the outer border was meant to be done in a cable, and none of the stencils I tried fitted, so I went for the old grid quilting. By the end of all the grids, I just about had that little quilting stitch mastered. The hand quilting alone took about 2 years to complete. Usual explanation - there were many projects in between. By now, of course, my sister-in-law, Annette, has totally refurbished and redecorated and no longer has the blue sofa. Oh well, she is still getting this quilt and I know she is going to really appreciate it and love it. She possibly won't even remember choosing it, and it is going to be a real surprise when I present it to her on Dec 20th. Annette is currently undergoing chemotherapy for breast cancer and is feeling very low and a little worse for wear. I am blessed to have five of the bestest sister-in-laws - love 'em all.